Schwartz & Wade, 9780375852183, 40pp. Jonah Winter is the author of You Never Heard of Sandy Koufax? !, Muhammad Ali: Champion of the World, and Dizzy, all of which received multiple starred reviews. He lives in Pittsburgh, Pennsylvania. Red Nose Studio creates eccentric worlds of sculptural and 3-D illustrations. Red Nose Studio’s illustrations have appeared in The New York Times, the Wall Street Journal, Chicago Tribune, and other publications. Starred Review, School Library Journal, January 2010: "This title should be a part of every elementary school ecology unit." Starred Review, Publishers Weekly, January 11, 2010: "Funky in every sense of the word." Starred Review, Kirkus Reviews, January 15, 2010: "A stinky story never seemed so sweet ... [a] fantastic combination of text and image." Starred Review, The Bulletin of the Center for Children's Books, April 2010: "[P]acked with visual delights." Review, The New York Times Book Review, November 7, 2010: "[A] glorious visual treat." Review, The Washington Post, March 21, 2010: "Cautionary? Yes. Hilarious? You betcha!" 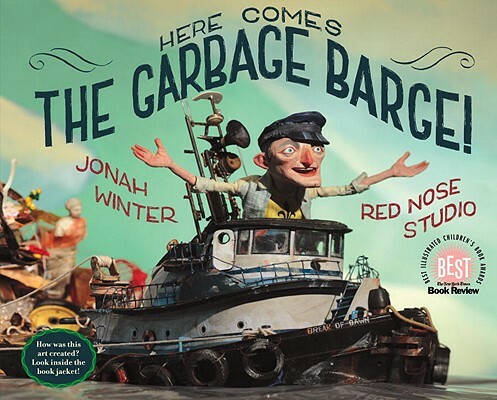 Review, Los Angeles Times, March 25, 2010: "Here comes the Garbage Barge! tells the story in wonderfully colorful language and inventive claymation-style illustrations." Review, Chicago Sun-Times, April 18, 2010: "As compelling as the story is, so are the unusual illustrations."